This article continues the discussion that we began last month on Shari`ah compliant home financing products. The focus is on the diminishing musharaka (musharaka mutanaqisa) or diminishing partnership. This is one of the two most common home purchase financing structures. As with the ijara, this structure has application to other Islamic banking, finance and investment products and transactions that will be considered in future articles. Thus, the discussion includes a bit of detail that is preparatory to those forthcoming articles. In summary, a diminishing musharaka home purchase financing makes use of a modern hybrid contract (the musharaka). It takes the form of a partnership in which one of the partners (the home buyer) promises to buy the equity interests of the other partner (the bank providing the financing) on a periodic basis until such time as the equity is completely transferred to the purchasing partner (home buyer). During the course of the purchase transaction, the bank partner leases its undivided interest in the property (the home and related land interests) to the home buyer partner. Before discussing the transaction in greater detail, it is prudent to consider a few of the relevant musharaka principles. Musharaka agreements are quite similar to Western partnership agreements in scope and coverage. In the context of a home purchase financing, the musharaka agreement may be expanded to include the full range of provisions that are found in documents governing conventional home purchase financings. Thus, for example, musharaka agreements may specify the term of the partnership, the purpose of the musharaka, limitations on the powers or permissible methods of dealing of each of the partners, the terms of dealing that are required and those that are permitted, circumstances in which the various partners will have consent rights, and the full panoply of representations, warranties, covenants, insurance requirements, events of default, remedies and termination rights. In some structures, some of the foregoing concepts (such as covenants, events of default and remedies) are included in the lease (ijara) of the bank partner’s undivided interest in the property to the home buyer partner. A partner in a musharaka may purchase the shares or interests (hissas) of the other partner(s) in the musharaka. Any such purchase may be of the whole or it may be partial and incremental. The AAOIFI Partnership Standard allows any partner to purchase the assets of the musharaka at their market value or at a price agreed at the date of the purchase of the assets.6 This has obvious implications for hissa purchases as well. However, it is not permissible to agree to buy the assets on the basis of face value. Many scholars are of the opinion that the provisions relating to the purchase of hissas should be in a document separate and apart from the musharaka agreement. Others allow the provision to be in the musharaka agreement. Usually, these provisions allow a partner to buy another partner’s hissas within an agreed period for a fixed price. The funding, financing and purchase of the home (including land or interests in land) are illustrated in FIGURE 1: PURCHASE OF HOUSE. FIGURE 2: LEASING AND OWNERSHIP illustrates the status of ownership and leasing prior to and during the course of the Hissa purchase transactions that are used to effect repayment of the Bank financing. In the diminishing musharaka structure, the Home Buyer identifies a property to be purchased and negotiates a home purchase agreement with the third-party Seller. That home purchase agreement (not illustrated in Figure 1) must be acceptable to the Bank that will provide the home purchase financing. After the Musharaka has obtained title to the property, the Bank leases its undivided right, title and interest in, to and under the property to the Home Buyer. This is illustrated as step ④ in Figure 2. The leasing arrangements allow the Home Buyer to occupy and use the property. The leasing arrangements may also include a managing agent arrangement (as a separate document) pursuant to which the Home Buyer agrees to maintain the property and maintain casualty insurance on the property as these are obligations that may not be passed to the tenant in a Shari`ah-compliant lease.8 The leasing arrangements may also provide for rents that, combined with the hissa purchase payments, ensure the adequacy of the amortization schedules desired by the Bank, rendering considerable financial flexibility to the structure. The financing provided by the Bank is paid and retired through the purchase and sale of the Bank’s Hissas, which are incrementally and periodically acquired by the Home Buyer from the Bank. This sequence of transactions is illustrated in FIGURE 3: PURCHASE AND SALE OF HISSAS. In Figure 3 (and the other Figures in this article), the undertaking of the Home Buyer to purchase the Hissas of the Bank is not separately shown; it is assumed to be included in the Musharaka Agreement. The amounts of the Hissa purchase payments are determined in accordance with the amortization schedule used by the specific Bank providing the financing. Each payment includes both a profit component and a principal component, with the relative amount of each component varying over time in much the same manner as the relative amounts of interest and principal on a conventional interest-bearing mortgage loan vary over time. Frequently, the amortization schedule is essentially identical to that on a conventional 30-year or 15-year mortgage financing. However, the structure of the amortization schedule will be determined in discussions with the Shari`ah scholars that supervise the home purchase finance program for the Bank. Different scholars have different views of the permissible pricing for purchases of the Hissas and these pricing considerations will influence the exact amortization schedules. It is also to be noted that the lease payments provide additional flexibility with respect to overall pricing of the transaction and the sum of the lease payments and the Hissa purchase payments, taken together, will often equal the combined profit and principal amortization that is desired by the Bank. There are two variations in the termination provisions of the diminishing musharaka structure. One variation, and the less common variation, involves termination without an undertaking to purchase (wa’d). In this variation, the exercise of remedies in connection with an event of default entails selling the property in the market and sharing the proceeds between the Bank and the Home Buyer in accordance with their respective capital contributions at the time of the sale. The more common structural variation involves the use of an undertaking to purchase (a wa’d) pursuant to which the Home Buyer agrees to purchase all of the Hissas of the Bank at the time of the event of default and demand by the Bank. It is the mechanism by which the Bank accelerates and unwinds the structure prior to the scheduled final maturity. The Home Buyer is obligated to purchase all Bank Hissas immediately at a fixed price (equal to the outstanding principal plus accrued profit plus fees, costs and expenses). Typically, there is full recourse to the Home Buyer in respect of the payment of these amounts. If the Home Buyer is not able to make payment in full for all of the Bank’s Hissas, the property will be sold at an auction and the proceeds are applied to make payment in full to the Bank, including in respect of its fees, costs and expenses in exercising remedies, and the excess, if any, is distributed to the Home Buyer). The next article will continue the discussion of Shari`ah-compliant home purchase financing products. It will take up murababaha structures and then move to bay’ bithaman ajil and istisna`a – parallel istisna`a structures. As the Sultanate of Oman prepares to roll out its new legal and regulatory framework for Islamic banking in the coming months, we will be covering Islamic banking in the Client Alert as it is an important and growing field. This article is the third in a series by Curtis partner Michael J.T. McMillen, an Islamic finance specialist based in our New York office who provides support to our Islamic banking practice in Oman and throughout the Middle East region. 3. This article addresses personal home financings, and not commercial ventures involving subletting or the generation of profits from the operation of the acquired asset(s). Thus, profit and loss principles are not discussed. 4. This article does not address complexities of in-kind contributions because the current scope is limited to personal home financings. 5. See, e.g., the AAOIFI Partnership Standard, supra note 1, at § 3/1/4/1. 6. See, e.g., the AAOIFI Partnership Standard, supra note 1, at § 3/1/6/2. 7. In some jurisdictions, the Home Buyer takes title to the property, acting as an agent for and on behalf of the Musharaka. This variation may be used in jurisdictions that impose a transfer or similar tax on the movement, to the Home Buyer, of title to the property upon dissolution of the Musharaka (as discussed below). 8. In some transactions, these obligations are addressed in the musharaka agreement. 9. Under the laws of most jurisdictions, a partnership must have greater than one partner (and cannot exist if there is only one partner). In those jurisdictions, the partnership is automatically dissolved upon the sale of the last of the Bank’s Hissas to the Home Buyer, whereupon the Home Buyer becomes the sole and direct owner of the property. Curtis will host a seminar on Shari'ah-Compliant, Tax Effective Financing and Investing. 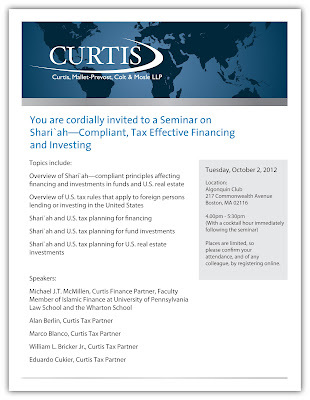 The seminar will be held at the Algonquin Club in Boston, Massachussetts on Tuesday, October 2, 2012. Further information is available on the invitation below. It was recently announced that the Sultanate of Oman, represented by the Capital Markets Authority (CMA), has become a signatory to the Multilateral Memorandum of Understanding (MMOU) on cross-border information sharing of the International Organization of Securities Commissions (IOSCO). IOSCO, the worldwide association of national securities markets regulators from over 115 countries, first adopted the MMOU as a means for national regulators to promote unified global standards and benchmarks for securities regulation and to facilitate the cross-border sharing of information amongst national regulators in order to combat cross-border violations of securities laws. Oman joins over 80 other countries which have signed up to the IOSCO MMOU. This important development affirms the Sultanate’s commitment to further integrate itself in the global economy, and also should provide the CMA with further resources as it continues to refine Oman’s capital markets regulations to best promote and protect the needs of the national economy. It is often thought that an agency relationship is the best way for a foreign entity to do business in Oman. Under Omani law, the purpose of an agency is for a foreign entity’s goods to be promoted and/or sold in Oman. An agency is not supposed to involve the physical presence in Oman of the foreign entity. The expectation of the legislator is that the Omani agent will import the goods into Oman and sell them within Oman, without personnel of the foreign entity physically being in Oman. In reality, there are many instances in which a foreign principal wants its representatives to be in Oman, based on an agency relationship. This normally means that the Omani agent becomes the sponsor and employer of the individuals sent to Oman by the foreign principal. This can cause problems for both parties. For instance, the agent may terminate the worker given that the worker, whilst in Oman, is a bona fide employee of the agent, rather than of the principal. Alternatively, the foreign principal may instruct the Omani agent to dismiss the worker. The agent then complies with this directive, only to be hit with an unfair dismissal claim by the worker. This may cause difficulties if the foreign principal is unwilling to fund a lawyer to defend the agent in the Omani courts. The agent also may face problems if the foreign principal refuses to provide the funds necessary to satisfy any final, non-appealable Omani court judgment made against the agent in its role as Omani employer. There also have been instances in which agents have filed spurious criminal complaints in Oman against the workers sent by the foreign principal, in a bid to gain leverage in any dispute with the foreign principal. Another aspect to consider is tax. The Tax Authority may take the view that the presence of the foreign principal’s representatives in Oman is sufficient to deem that the foreign entity has set up a permanent establishment in Oman from the tax perspective. However, if the foreign entity refuses to pay Omani income tax, there is a possibility that the Tax Authority may pursue the Omani agent for that tax. In conclusion, any situation which involves workers of a foreign entity being sponsored in Oman by a local entity can cause problems. Omani legal advice should be sought before entering into any such arrangement. This article considers which shares can be pledged under Omani law, the process of registering a share pledge, dealing with pledged shares, how to release a share pledge, and finally how a share pledge can be enforced. Which Shares Can be Pledged? The shares in a joint stock company may be pledged under the Omani Law of Commerce. It is not possible to pledge shares in a limited liability company or partnership as such shares may not be represented by negotiable instruments and are more akin to a “participating interest” than shares.Shares in an open joint stock company must to be registered on the Muscat Securities Market (MSM) by the Muscat Clearing & Depository SAOC (Muscat Depository) and shares in a closed joint stock company need to be registered before such shares can be transferred or pledged. The registration requirements for a share pledge are controlled by the Muscat Depository and, currently, the entity receiving the share pledge (the lender or the pledgee) has to register and open an account initially with the Muscat Depository by providing copies, suitably authenticated, of its corporate documents, a letter requesting the opening of an account and the completed application form. It will then receive a depository number from the Muscat Depository. • whether cash profit (cash dividends) and free shares (stock dividends) are pledged or not. Other conditions can be inserted in to the final clause (Clause 3: Other Conditions). We would recommend that various additional terms are included in the share pledge including a description of the obligations secured by the share pledge. The share pledge needs to be executed by the pledgor and the pledgee and, if a party is a foreign entity, the execution of the share pledge needs to be suitably authenticated. Then, the share pledge itself can be registered by lodging it with the Muscat Depository together with the various documents including a list of authorised signatories and the commercial registration papers of the pledgor and the pledgee. Again, if a party is a foreign entity any corporate documents will need to be suitably authenticated. The share pledge will take effect from the date it is registered by the Muscat Depository and they will issue a Statement of Account for the pledgor, showing the pledged shares. Prior to the registration of the share pledge, the share pledge will take effect as a private contract between the parties only. Next month, Part II of this article will discuss certain key aspects of Omani share pledges, such as how they may be dealt with, released, and enforced. This is the second in our continuing series of articles on basic Islamic banking, finance and investment concepts. This article, and subsequent articles, begin to explore the palette of products that are available to customers of Shari`ah-compliant banks. It seems appropriate to begin with hearth and home, which is a fundamental focus of individuals, banks and other finance providers, the business community and governments. It is a topic of acute interest in the Middle East at the moment as a result of the recent adoption of a mortgage law in Saudi Arabia. As a result of that law, housing finance in Saudi Arabia is anticipated to grow, and constitute an entirely new industry. 1 That development is expected to enfranchise a significant portion of the Saudi population as home financing becomes available and the Saudi population moves to home ownership and enhanced participation in the Saudi economic system. The mortgage law implements Shari`ah-compliant rahn- concepts and will stimulate the growth of Shari`ah-compliant home financing, and thus the growth of Islamic banking. Spill-over stimuli in surrounding countries is inevitable. And, as one of their first products, Islamic banks in the Sultanate of Oman will likely offer home purchase financing. We will summarize five of the most frequently used home purchase financing structures provided by Islamic banks. They are: (a) the lease (ijara); (b) the diminishing partnership or diminishing musharaka (musharaka mutanaqisa); (c) the cost-plus sale (murabaha); (d) the deferred payment sale (bay bithaman ajil), which is used in Malaysia and Indonesia but only infrequently elsewhere; and (e) the two-tier construction contract financing (istisna – parallel istisna), which is a construction financing structure rather than a purchase structure. Some of these structures are used in Islamic banking, finance and investment transactions other than home purchase financing. Accordingly, this and subsequent articles discuss each of these structures in some detail before moving on to other structures. The lease (ijara) financing structure is the most widely used Shari`ah-compliant structure in the world for sophisticated financings. It is simple in concept. An Islamic Bank (usually through a surrogate) purchases a house using the Bank’s funds (in the leverage amount, say, 75% of the house purchase price) and funds from the Home Buyer (in the down payment amount of, say, 25% of the purchase price). The acquisition of the house is illustrated in FIGURE 1: PURCHASE OF HOUSE (a surrogate purchase, through a “Funding Company” is illustrated). In the Figure 1 example, the house is owned by the Bank surrogate, the Funding Company. The house is then leased to the prospective Home Buyer for a period of time (say, 15 or 30 years). The Bank’s return is the profit on the lease. The lease rent schedule will be quite similar to a conventional home purchase financing amortization schedule. If the Home Buyer makes all its rental payments over the term, the Home Buyer may purchase and take title to the home for a further final payment, which is usually nominal. This article assumes that the Funding Company is a disregarded entity for income tax purposes. That is not the case in many jurisdictions, and in those jurisdictions additional expense items are structured at the Funding Company level to offset the “rental income” of the Funding Company. An ijara is a lease of an object or services involving the transfer of the usufruct or manfa’a (the use of an object or the services of a person) for a rent consideration. The nature of the usufruct must be precisely defined, the rental consideration must be for a fixed value, 3 whether payable in a lump sum or installments, and the term of the lease must be precisely determined. Both the rent and the term must be clearly ascertained and designated in the lease. The rent may escalate or diminish during the term so long as the amounts of such escalation and/or decrease are specified and known to both parties. 4 The lessor is responsible for structural maintenance of the assets and correlative obligations (e.g., casualty insurance) and these obligations may not be passed to the lessee pursuant to the lease. The lessor is entitled to receive its rent as long as the lessee has the enjoyment of the leased assets as specified in the lease, but not after termination of the lease. FIGURE 3: GENERIC IJARA (LEASE) FINANCING: DOCUMENTATION summarizes the documentary structure for a lease structure (without security documentation). The structure depicted in Figure 3 is of a generic home financing transaction. However, this structure (in various iterations) is used in a wide range of transactions, including financings of real estate, petrochemical, electricity, mining and infrastructure projects, among others. It is also the base structure for private equity transactions. It is used in Middle Eastern, North American, European and Asian jurisdictions. The lease structure may be a “bifurcated structure” involving a conventional loan arrangement for leverage (or gearing), or purely Shari`ah-compliant. Referring to Figure 3, a bifurcated structure will entail a conventional interest-bearing loan from the Bank to the Funding Company pursuant to the Financing Documents (to the left of the dotted red line). All documents and transactions to the right of the dotted red line will then be compliant with the Shari`ah. Bifurcated structures are quite common as they allow conventional banks to participate in Shari`ah-compliant transactions. 5 The reasons for the widespread acceptance of this structure by interest-based financiers are apparent: those financiers make conventional loans, as they would in any financing; the relevant credit, underwriting and risk criteria are essentially the same as in any conventional financing, as is the analyses of those elements; there are no changes to financial reporting conventions; and there are no changes to the financier’s back office operations. The entirely compliant version is more frequently encountered in jurisdictions within the Organisation for Islamic Cooperation. In most jurisdictions, banks are not permitted to own real property. 6 In order to take control of a house (and related land) for the purpose of leasing it to a home purchaser, the bank will arrange to have the property owned in a special purpose entity (each, a “Funding Company”) by a third party. 7 While title to the house (and possibly the land) will be in the Funding Company, that entity will usually have no ability to make any decisions or determinations with respect to the property; all such decisions and determinations will be made by the Bank, a process that is established and controlled pursuant to the Financing Documents. As noted above, and in Figure 1, the Home Buyer will inject a down payment and the Bank will provide the leverage financing. In a bifurcated structure, the leverage will be in the form of a conventional interest-bearing loan. If an Islamic Bank is providing the leverage financing, the structure for the contribution of funds by the Bank will vary from one jurisdiction to another. For example, the Bank may inject equity funds into the Funding Company. Or the Bank may purchase a sukuk issued by a Funding Company or another vehicle that effectively securitizes the rent flows from one or more Funding Companies. Alternatively, the Bank may take a participation interest in a Funding Company, with the profit being all of the rent flow on the Lease (Ijara) between that Funding Company and its related Home Buyer(s). Or the Bank may structure a musharaka or mudaraba arrangement that controls the Funding Company, with essentially all of the profits (derived from rental income) of the musharaka or mudaraba going to the Bank. The Funding Company will lease the project assets to the Home Buyer pursuant to the Lease (Ijara). The basic rent payable by the Home Buyer to the Funding Company under the Lease (Ijara) will be structured to be exactly equivalent to the debt service payable by the Funding Company to the Bank under the Financing Documents (and related documents). The transaction will be structured such that any default on the Lease (Ijara) (and related documents) will constitute an event of default under the Financing Documents. That is relatively easy to achieve by inserting a cross-default to the Lease (Ijara) as an event of default in the Financing Documents. The obverse is more difficult to achieve because applicable Shari`ah precepts preclude having one of the Lease events of default being a Financing Document event of default. The earliest structures achieved the desired result by mirroring, with precision, the representations, warranties, covenants and other provisions of the Financing Documents in the Lease (Ijara) and related documents. This was a tedious and costly process and more expeditious methods of achieving this result have since been developed. The Understanding to Purchase is a Shari`ah-compliant sale and purchase agreement that allows the Funding Company, at the direction of the Bank, to cause the Home Buyer to purchase the house upon a Lease event of default (and upon the occurrence of any other mandatory prepayment provision). This is necessary because the Shari`ah prohibits acceleration of future rents, and future rents will include all the outstanding principal of the financing at any given time. The purchase price will be equal to the outstanding principal under the Financing Documents from time to time. The Home Buyer may also desire to prepay the financing, in whole or in part. The Understanding to Sell is a purchase and sale agreement that allows this result. The purchase price will be equal to the amount of the financing prepayment at any given point in time. In the case of each Understanding, the purchase price will be initially paid by the Home Buyer to the Funding Company; the Funding Company will then use those funds to make payment under the Financing Documents. Shari`ah principles and precepts applicable to leasing preclude the lessor from passing structural maintenance obligations (and correlative obligations) to the lessee pursuant to the Lease (Ijara), thereby precluding “triple-net” leasing that is so common in Western financial arrangements. To bring the Shari`ah-compliant financing transaction into harmony with existing Western markets, a mechanism is invoked to shift the structural maintenance obligations (and correlative obligations) to the Home Buyer (lessee). This occurs in the Managing Contractor Agreement where the Funding Company (lessor) hires the Home Buyer to perform structural maintenance and to undertake defined correlative obligations. The Managing Contractor Agreement contains a second set of provisions that address the making of decisions and determinations and the direction of actions by the Funding Company. Basically, these provisions provide that any decision or determination to be made by the Funding Company (a) with respect to the Lease (Ijara) and the Understanding to Purchase will be made by the Bank, 8 and (b) with respect to the Financing Documents will be made by the Home Buyer. The result is the removal of the Funding Company from decision-making. Of course, nothing is quite so simple as one would like. Frequently, the Bank is not willing to make these decisions and determinations on behalf of, or to direct actions by, the Funding Company. This reluctance may relate to liability concerns or internal institutional practices. Similarly, for Shari`ah reasons, the Home Buyer is unable to make decisions and determinations and have responsibilities in respect of the Financing Documents and related conventional interest-bearing arrangements. Harmonization of these positions with the principle stated in the first two sentences of this paragraph entails some careful structuring and drafting, but is achieved in the Managing Contractor Agreement. Collateral security structures for the lease transaction are quite similar to those in a conventional interest-based home financing, although the exact structures will vary from jurisdiction to jurisdiction. FIGURE 4: COLLATERAL SECURITY graphically depicts a generic collateral security structure for a lease-based financing. There is a mortgage from the Funding Company to the Bank with respect to all right, title, interest and estate of the Funding Company in and to the house and the land. In addition, the Funding Company will collaterally assign to the Bank whatever collateral security the Funding Company received from the Home Buyer. This security package will secure the obligations of Funding Company to the Bank under the Financing Documents, i.e., the repayment of the financing. It is exercisable by the Bank upon an event of default under the Financing Documents. The Home Buyer will provide to the Funding Company a security interest in and to all of the Home Buyer’s right, title, interest and estate in and to the house and the land. That security interest may also include other assets of the Home Buyer, possibly including monies in the Home Buyer’s bank accounts. It also may include a personal guarantee of the Home Buyer in respect of the rent and purchase payments. These security interests are exercisable by the Funding Company (at the direction of the Bank) upon a Lease event of default, but not a Financing Document event of default that is not a Lease event of default. This collateral may not secure the Financing Document obligations, only certain Lease and related obligations. Our next Client Alert article will continue the discussion of Shari`ah-compliant home purchasing financing products. We will take up diminishing musharaka structures and murabaha structures and then move to istisna` – parallel istisna` structures. As the Sultanate of Oman prepares to roll out its new legal and regulatory framework for Islamic banking in the coming months, we will be covering Islamic banking in the Client Alert as it is an important and growing field. This article is the second in a series by Curtis partner Michael J.T. McMillen, an Islamic finance specialist based in our New York office who provides support to our Islamic banking practice in Oman and throughout the Middle East region.